Find yourself slain by a minion of Hell? That beast can now hunt down your friends in their games. Among the announcements at the Anaheim BlizzCon event this weekend were a few new features exclusive to the coming PS4 version of Reaper of Souls, the first expansion for Diablo III. One of the most interesting of these new elements is "Avenger Kills," which starts when a character dies to one of the numerous hellspawn roaming Sanctuary. When that happens, said senior level designer Matthew Berger, there's a chance that monster will level up and jump into a portal to emerge in the game of someone on their PS4 friends list. When that friend starts their game, they'll find themselves in store for a dramatic showdown - the skies will darken and their comrade's old foe will appear before them. The monster will have a new title naming it as the "Bane" of whomever it killed, such as "Matthew's Bane," Berger said. If the monster wins once more, it levels up again, becomes the new player's "Bane" and will then hop into the game of another friend to continue its reign of terror. However, if the monster is slain, both its killer and the player last killed by it get some loot. It's not yet been decided just how strong these "Avenger Kill" monsters can become, but ones that become too powerful may eventually retire, Berger said. And if you want to send something to your friend's game that won't maim them, the PS4 version of Reaper of Souls also lets you gift loot to others who aren't in your game. Players who get a Legendary loot drop will now get a second bonus item to send to a friend over the PS4's mail system. The gifted item will be either Rare or Legendary and usable by the receiving player's character class, Berger said. The gifting and "Avenger Kills" are meant to give players a way to connect with each other even when they're not playing in the same game, he added. The PS4 Reaper of Souls team also has the PlayStation Vita's Remote Play service "on our radar," said Berger, but they have some reservations about the handheld's lower screen resolution. Reaper of Souls for the PS4 will be sold in an "Ultimate Evil" edition that also includes all four acts of the original Diablo III and will run natively at 60 frames per second and 1080p resolution. 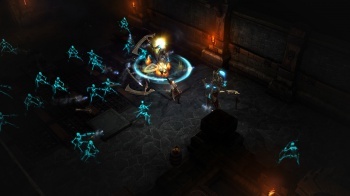 It is set for release alongside the PC version of Reaper of Souls in 2014.